About "Construction of angle bisector"
Even though students know what is angle bisector, many students do not know, how to construct angle bisector. Here we are going to see "How to construct angle bisector step by step"
To construct an angle bisector, you must need the following instruments. The steps for the construction of an angle bisector are. Construct an angle of given measure at O using protractor. 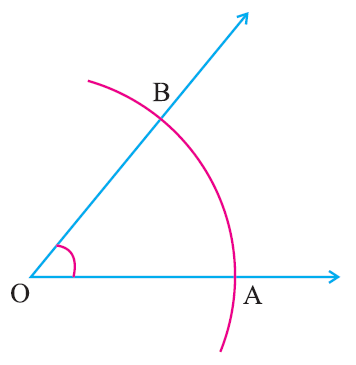 With ‘O ’ as center draw an arc of any radius to cut the rays of the angle at A and B. With ‘A’ as center draw an arc of radius more than half of AB, in the interior of the given angle. 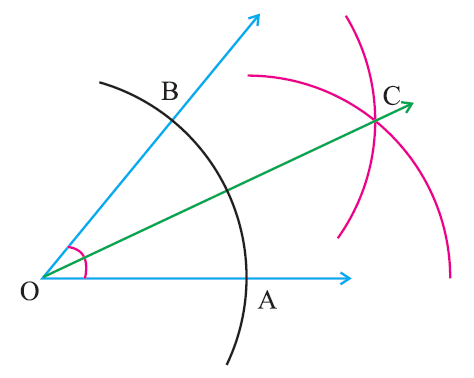 With ‘B’ as center draw an arc of same radius to cut the previous arc at ‘C’. 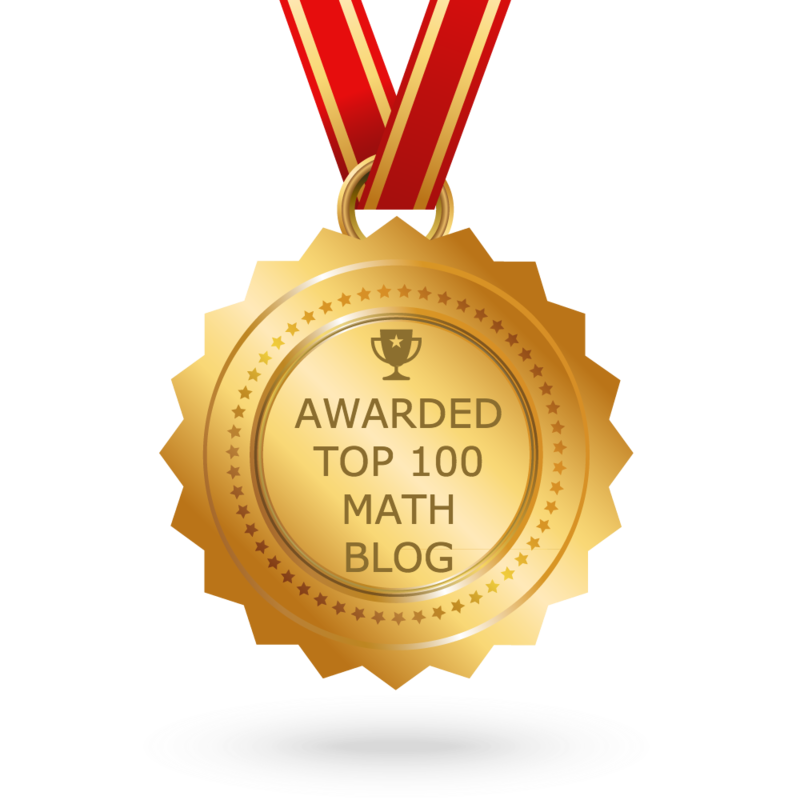 OC is the angle bisector of the given angle. This construction clearly shows how to draw the angle bisector of a given angle with compass and straightedge or ruler. 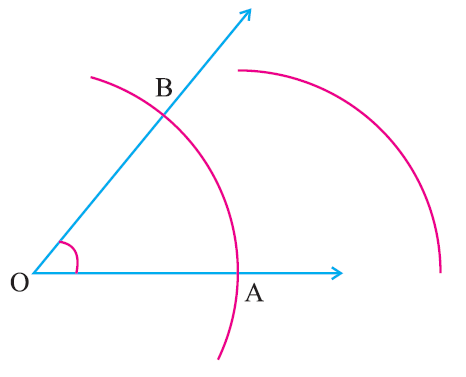 The angle bisector divides the given angle into two equal parts. For example, if we draw angle bisector for the angle 60°, the angle bisector will divide 60° in to two equal parts and each part will measure 30°. The angle bisector of a given angle is the line of symmetry which divides the angle into two equal parts. Construct <AOB = 80° and draw its angle bisector. With ‘O’ as center draw an arc of any radius to cut the rays OA and OB at the points X and Y respectively. 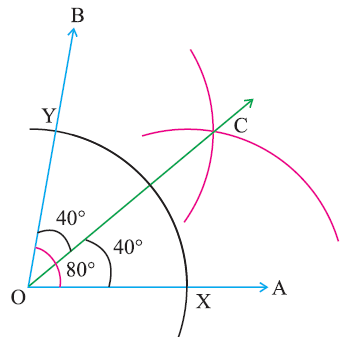 With ‘X’ as center draw an arc of radius more than half of XY in the interior of the angle. With ‘Y’ as center draw an arc of the same radius to cut the previous arc at C. Join OC. 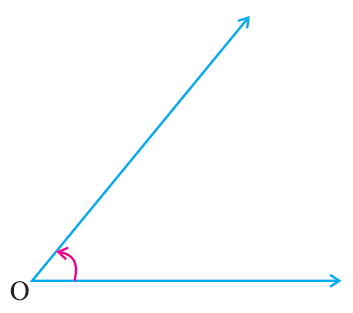 Using the steps explained above, in the above figure, angle bisector is drawn at O.
OC is the angle bisector of the given angle 80°. Hence, OC divides the angle 80° in to two equal parts and each part measures 40°. After having gone through the stuff given above, we hope that the students would have understood "How to construct angle bisector"